Some years ago, I had a friend who was a gunsmith. He loved to tinker and try modifications to weapons. He came up with a machine pistol, capable of firing 1300 rounds per minute. The difference between his new gun and everything else on the market at that time, was a unique compensation system he invented, which vastly reduced recoil – meaning the gun on full auto didn’t pull off target as it was fired. He thought the Military would jump all over it, so he made two copies and tried to sell it to them. There were several other potential customers in Federal Law Enforcement he demonstrated the weapon to. The post-Vietnam Military wasn’t interested in small, handheld weapons. The Law Enforcement agencies went nuts, even though the weapon could never be sold legally to the public – and had it banned from production in the US and banned for export. The rationale was that if a bad guy ever got hold of one of them, because of it’s small size and conceal ability, rate of fire, and accuracy he would be virtually unstoppable. The two prototypes were destroyed. I think this gun should be banned. First, from a Law Enforcement standpoint a Cop will never know whether that Cell Phone a suspect has is really a Cell Phone – resulting in numerous killings of innocent people. Next, something like this provides the conceal-ability which would allow a John Hinckley character, who shot President Reagan to get close enough undetected to assassinate a political figure. Hinckley used a .32 Caliber which is significantly smaller. The inventor is lying in the below article about the effectiveness of the .380 round. It is, in terms of destructive power, only a step or two below that of a 9 mm. Generally it is used in small, semiautomatic handguns, which don’t have the accuracy or range of bigger guns due to the barrel length. I’ve seen some pretty crazy stuff out there, including laptops which convert into sub-machine guns. But those types of systems are no available to the general public, and require stringent licensing. This is absolutely STUPID nuts. Its creator wanted a more discreet firearm to carry around. This is not a smartphone. This is a gun. 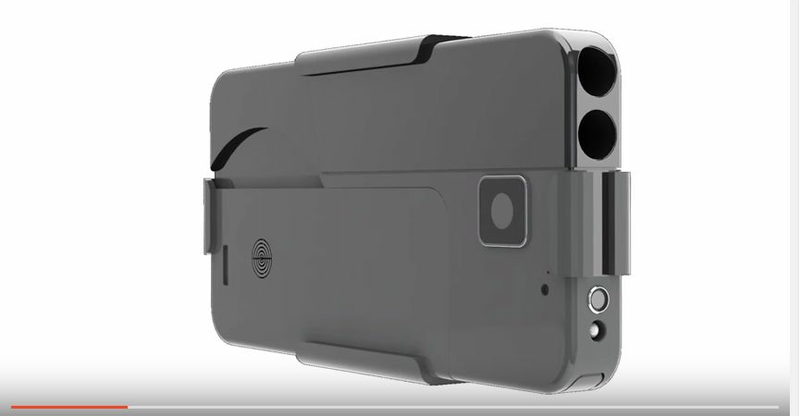 It’s the Ideal Conceal, a .380-caliber pistol that folds up into a box shape. 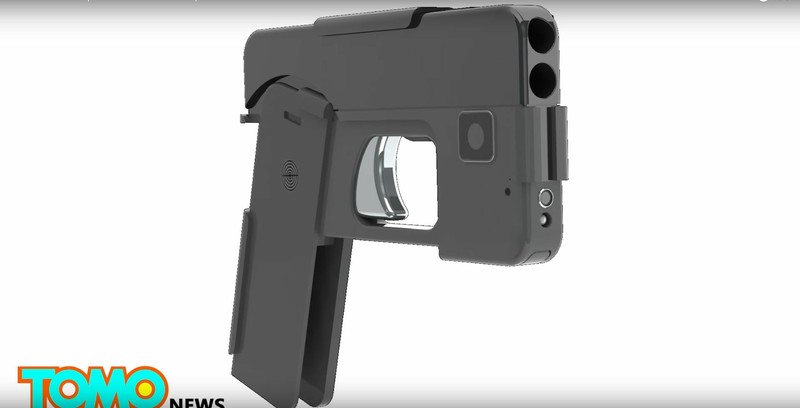 The creator designed the firearm to look like a phone so people could carry it around in public without attracting attention. Note – there appears to be capability to mount an internal laser sight on the front. The website also advises folks to check local concealed carry laws before purchasing the firearm. “A little child, a boy about 7, saw me, and said, ‘Mommy, Mommy, that guy’s got a gun!’ And the whole restaurant of course turns and stares at you. And I thought, there’s just got be something better,” said Kjellberg, per NBC affiliate KARE in Minneapolis. Critics of the gun have pointed out that it could pose a security risk in public places like airports, according to KARE. But Kjellberg insists the gun is meant for people concerned about their own personal safety. He told HuffPost that the gun, which holds two rounds, isn’t very powerful. “If you’re going to try to hurt somebody, it will probably take more firepower,” Kjellberg said. There were 13,286 gun deaths in U.S. in 2015. Between 2007 and 2013, people carrying concealed weapons were responsible for nearly 500 civilian deaths, according to the Violence Policy Institute. In recent years, police have shot and killed several people carrying items mistaken for guns. In January, police in Las Vegas shot and killed an unarmed man carrying a cell phone that looked to police like a firearm.